First, there was Mickey Mouse. Then came Mighty Mouse. Now, at the dawn of the 21st century, comes micromouse, the little robot that could. Actually, a total of 13 micromice visited the UC San Diego campus last month, for a competition pitting teams from eight universities. It was the first Southern California competition hosted by UCSD IEEE at the Jacobs School of Engineering, but Kansas State University joined in the fun too. Fittingly, UCSD teams took first and second place in the competition. UCLA came in third. The robots don’t look like rodents, but their programming is geared toward solving a maze and finding its center—without getting a piece of cheese as a reward. The competition is a great learning experience and allows students to learn as much as during a single undergraduate course, said Minji Kim, a graduating senior and president of UCSD’s chapter of IEEE for 2010-11. 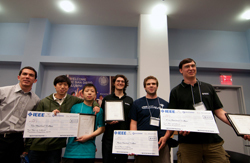 IEEE was able to secure a grant from Qualcomm to organize the competition. “I think a project gives students valuable experience because they have to learn everything from scratch,” said Kim, an electrical engineering and math double major. Kim will answer questions about the competition and IEEE during a live chat on the Jacobs School of Engineering Facebook page at 1 p.m. June 15. The mice are completely autonomous and the goal is to get to the center of the maze as fast as possible. They typically use a microcontroller and infrared sensors reflecting off the walls to make their way through the maze. Some also use a wireless interface to transmit debugging data back to their team’s laptop. 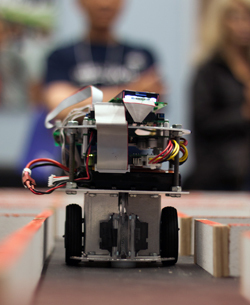 Most teams build the robots with off-the-shelf components. But some prefer to put together a custom circuit board, chassis and other parts. Many of the components students work on will be part of their future professional lives as engineers, said Kim. Teams also use different strategies to make their way through the maze, custom-built here at the Jacobs School of Engineering in 2009 and upgraded in summer 2010. 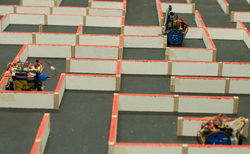 All robots map the maze, then return to the starting point and make a run for the center, using the fastest route they’ve found. Some prefer to map the whole maze, then plot a route to the center. Others prefer to map the maze only until they’ve figured out where the center is, then make a run for it. Teams are not allowed to reprogram their robots after they’ve seen the maze. A UCSD team led by Alex Forencich, a fourth-year electrical engineering student and project manager of UCSD IEEE for 2011-2012, solved the maze in just 39 seconds. The second-place team “Vampires”, also from UCSD, took 75 seconds, the third place team “In Green We Trust”, from UCLA, 77 seconds. This year’s contest took place in the Qualcomm conference room here at the Jacobs School, in front of an audience packed with Qualcomm employees, UCSD students, IEEE San Diego section members and faculty. During lunch time, teams got together around the maze to share tips and ideas in a more relaxed setting. This will be the last year that Minji Kim, the outgoing president of IEEE, was involved with the micromouse competition. She still is taking some math classes this fall, but walked for graduation with her friends this month. The electrical engineering and math major will be out on the job market soon—with an impressive resume. She was received an award for her efforts at the Ring Ceremony June 11 at the Jacobs School. Kim thanked Qualcomm for sponsoring the micromouse competition; the judges— Professor Charles Tu from UCSD and Professor Dennis Briggs from UCLA; Farrah Nazemi and Larry Hamerman from IEEE San Diego section; two cell counting volunteers; the IEEE University Partnership Program; the UCSD ECE Department; the Jacobs School; and, lastly, UCSD IEEE officers and staff members for hosting the event.